Right now, the world economy is in a tough spot. Even during these penny pinching days, people all over are working hard to help others. Thanks to MyBlogSpark, I learned about the new project that Betty Crocker is working on. They have joined efforts with One Lap Top per Child to help provide laptops for children in Africa. Participating is easy thanks to the Win and Give campaign. With this new program, children can help in an easy and fun way. 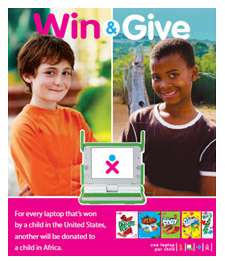 With specially marked boxes of kid favorites – including Fruit Roll-Ups, Gushers, Fruit by the Foot, and Stickerz & Shapes – your child could win one laptop to keep and Betty Crocker Fruit Flavored Snacks will donate another to a child in Africa. Each day from now through May 30, 2010, one laptop prize will be awarded to a U.S. winner. For every laptop won, one laptop will be donated to an African child through One Laptop per Child, an organization that creates educational opportunities for the world’s poorest children by providing each child with a rugged, low-cost, low-power connected laptop with content and software designed for collaborative, joyful, self-empowered learning. For your chance to win, simply enter the unique online code printed on participating Betty Crocker Fruit Flavored Snack packages on www.WinOneGiveOne.com. We were sent two boxes of Betty Crocker fruit snack. The boys enjoy them and they bring back fun memories from my childhood. One of my all time favorite snacks growing up were the strawberry Fruit by the Foot. There is just something fun about them, plus are a low calorie snack. Thanks to MyBlogSpark and Betty Crocker, one lucky reader will win two boxes of Betty Crocker Fruit Flavored Snacks and a $25 donation to One Laptop per Child will be made on your behalf. MAIN RULE – Answer one of the following questions: What have you done to encourage your children to help others? -or- What is your favorite experience that has been with helping others? 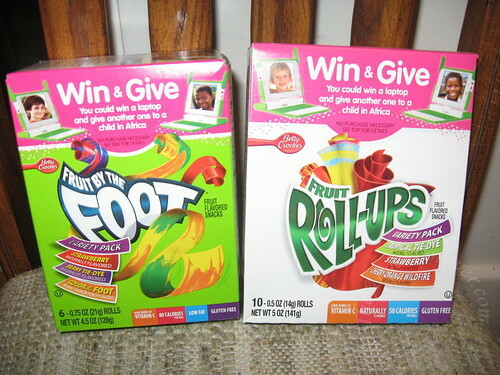 1 Bonus Entry – What is your favorite flavor fruit snack? To enter, please follow the rules above within the comment section. Contest starts today March 7th and ends at 10:59 EST on March 21, 2010. You do not have to be a blogger to enter, but must leave a valid e-mail address for me to contact you for mailing address once the giveaway is over. I will select the winner using random.org and contact you via e-mail. You will have 48 hours to claim the prize. If there is no response, another winner will be selected. Open to U.S. residents only. Disclosure: I received two packages of Betty Crocker Fruit Snacks with the Win & Give game pieces on them. In addition to this, $25 has been donated in my name to One Laptop per Child. No other compensations was given. The opinions expressed in the review are my own feelings about the promotion. My favorite experience helping others was definitely participating in a church outreach in our community where we washed windows for elderly people in our households. We spent the day scrubbing the outside windows and knocking down cobwebs. They are really appreciated it.